The Whitsunday Islands are one of Australia’s most famous destinations and we now know why. Located on the northeastern coast and the famous Great Barrier Reef, they offer a sumptuous wild nature if we venture beyond the few inhabited islands and the trips organised by tour operators. First let me tell you how we happened to discover them. It was on a sailing boat. We’ve been invited to sail for five days. And that was a good idea because we didn’t know how to sail. Actually, what is almost as wonderful as that was the way it all happened. It is a perfect illustration of what we particularly like when travelling: going where the wind blows. This time, it blew towards the open sea. Everything started in Nagasaki, Japan when one evening we met Jamie, a young British from Bristol. Encountering people during a trip is somehow fantastic as the relationship is most of the time direct and sincere. No conventions, no time to waste as our paths are crossing each other far away from home. In a few hours, everyone will go back on his/her own way (at least, most of the time). So, one night, a few beers and two or three emails later, we were invited to pay a visit to our new friend’s father, a seventy-year-old Welshman named Dewi. This tall man, chatty and teasing, came to retire in the small town of Airlie Beach, the main place from which we can reach the Whitsunday Islands. « He loves meeting new people and sometimes he’s looking for a crew to go sailing with», his son told us. The magic of travelling had operated. Well, since then the stars of our bumpy nights are still printed in our eyes. The Whitsunday Islands are an archipelago of 74 islands of various sizes situated off the coast of Airlie Beach (Queensland) in the Coral Sea. They used to be volcanic mountains linked to the continent, and their summits now form the different islands. Their name comes from « White Sunday », given by James Cook, the famous British captain, when he discovered them in June 1770, thinking that he had landed there on this holy day. During the five days we were out on the sea, we sailed around the “Central Islands”*, which are composed of the main islands. But still, they offer many bays of various depths to anchor the boat in for the night, a few crystal-clear beaches with hues from turquoise to indigo, and bits of nature where we might have the chance (or not) to meet a naked hiker communing with nature and wildlife. « Reeeady for tackiiing? » « Uh, yèèèèès… » (Didn’t we say that I was to do the cooking?). Apart from our sea legs, which we had in theory, we didn’t have much experience of sailing. But we were super motivated to learn! We already saw ourselves a lock of hair crossing the horizon line in a gust of wind, the mast of the main sail tilting in diagonal, and a few dolphins dancing on each side of the boat. The wind coming from the back: in other words, going faster than expected. (yes, that was before, when we thought that we had to have the wind coming from behind to move forward… Hey there! It seems we’ve just lost some of you…) Well, that was pretty much the image we had before starting. Feeling a bit like Christopher Columbus without the charismatic French actor Gérard Depardieu, but with the music, the choir and a sailing boat. In reality, Captain Dewi told us directly to stand on the deck to tame Anthea, our 41-feet single-hulled boat, and at that very moment we realised that sailing was a real sport. You have to react quickly, pull the ropes of the sails that weigh a ton, preferably without twisting a finger (naming no-one…). So, we tried to understand the instructions and sailing terms (in Anglo-Welsh and yelled in the wind over the loud waves, good luck! ), which rope to pull or release, and this as fast as the wind turns. Of course, in the beginning we were told off a few times and we experienced a few decelerations. But finally, Captain Dewi congratulated us for our performance. And we must say that we were a bit proud. When we sail – and especially on such a boat –, we must make compromises with Mother Nature. Sometimes, She let us in the middle of nowhere without even a small breeze to cool down… while waiting for a stronger wind to move forward. So, in order to decide which route to choose we had to take into account the direction and strength of the winds, as well as the time and level of the tides. Quite often, all these conditions had even had to be recalculated in the early morning, after having listened to the weather forecast spluttered on time by the radio. We realised that we’d better know a fair bit about sailing or the least faux pas could lead to dramatic situations. And thus we asked our captain what we should do if he came to fall over. It’s not just a matter of leaking a finger to know where the wind comes from. Fortunately, Anthea was rather docile and it has been very pleasant to sail on board around these beautiful islands. During the day, we stopped on lovely beaches for a swim, or to start a walk up to the summits covered by forests. Sometimes, we even went to explore the seafloor, swimming in the deep blue sea to reach the coast with a mask, a tuba and a wetsuit to protect ourselves from the jellyfish. At the end of the day, we would anchor for the night in a bay. A beer at 5pm, dinner at 7pm and bed time at 10pm, exhausted, after having watched the stars, rocked by the swell. Disconnected from the world of Men, connected to Nature and to us. Our days were busy and our nights restful. It’s impossible to say whether we would have appreciated to discover these islands in another way than this wonderful opportunity. We know that we’ve been very lucky. Especially when we passed huge catamarans full of people when we left the harbour or sailed back in. Apart from a few other boats with which we shared the bay at night and a few tourists in the beautiful lagoon of WhitHaven Beach, it was rather quiet, and we were nearly alone. We met some goannas (big lizards) in the forest, saw many birds here and there, ran into a few big turtles coming out to breathe at the surface, and watched colourful fishes and other underwater curiosities during our dives. 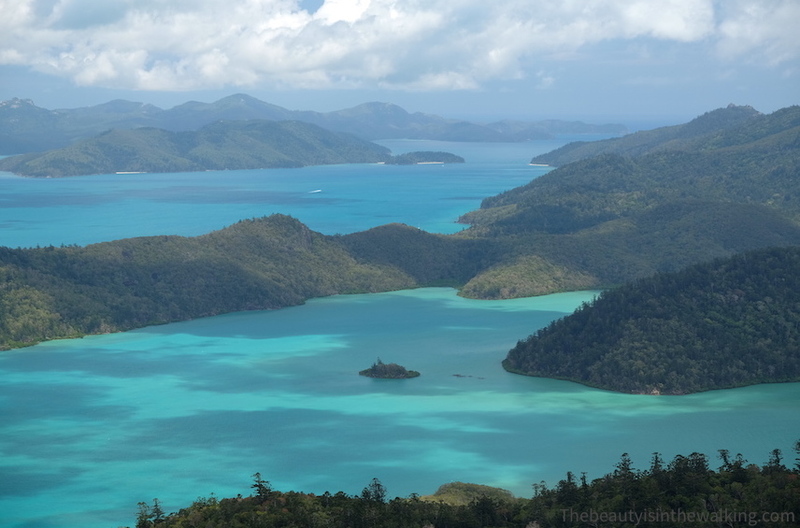 * The « Central Islands » are composed by North Molle Island, South Molle Island, Daydream Island, Hook Island, Whitsunday Island, Hamilton Island, Long Island, Lindeman Island, Haslewood Island and a few other small ones. DAY 1: We left Airlie Beach’s harbour towards Hook Island, anchored in one of the wings of Butterfly Bay. Snorkelling at the end of the day. DAY 2: We headed east to anchor on the north of the little Dumbell Island situated at the north of Whitsunday Island (the biggest island that gave its name to the archipelago). Nice snorkelling at the end of the day. DAY 3: We sailed to Whitsunday Island and anchored at Tongue Bay. We walked up to the lookout that overviews the lagoon of Whithaven Beach on the other side. After having walked down to the lagoon, we had a swim in the pretty little Betty’s Beach situated a bit further behind the rocks. A Blast! Back to the boat we sailed all along Whithaven Beach, passed by Chance Bay and anchored for the night at Turtle Bay that has the shape of a… turtle. DAY 4: We continued along the coast of Whitsunday Island, passed next to Cid Island to anchor in the really charming and shallow Dugong Bay. We swam at Lady Island (rebaptised Lady Véronique Island for the occasion! ), a microscopic island where only birds nest. We reached by dingy the starting point of the hike to Whitsunday Peak in order to admire the stunning 360-degree overview on the surrounding islands. DAY 5: We sailed back to Airlie Beach, passing by the Molle Islands, as well as Daydream Island to say hello to the three mermaids. Enjoying the jaw-dropping lagoon of Whitehaven Beach. It looks a bit like the white sand beaches of the computer screen that one watches with envy when it’s -5°C outside, but without any “urgent” file left under the coconut tree (there’s no coconut tree anyway). The best moment to watch the lagoon is definitely right between high and low tide so that you can enjoy the wide range of blue nuances (and not only see it sandy or flooded by dark blue water; it would be a pity…). Encounter it first from the viewpoint above to get a stunning overview. Watching the stars. Believe us, we can spend hours watching the sky of the Southern hemisphere to look for the Southern Cross. And even longer with a glass in hand. What a fantastic opportunity and adventure Vérone. We hope the spiritual adventure at the temple is equally fulfilling.